Its been a whirl since Halloween what with the pumpkins, the lumieres, the overbuying of candy (always afraid to run out) and the this kid is doing this, that kid is doing that...with the week ahead's expectations and deadlines (as expected) expanding and changing that it made this poor girl's head expand and expand and expand. I am finally deflated and can talk again. We have been going getting this person here, that person there, and the chores in between...so we approach the new work week with at least an attempt at trying to stay on keel. R goes to Miami for 3 days. I get out of here Sunday for 10 days...and have as usual, a road block of work with more piled on top (..."here is a website we need immediately, our objectives and raises are all built on the success of the job...")with all sorts of guilt and agendas built upon the brick (or lack thereof) in the thinking. So, I work weekends and nights to get this done when they have had ( lemme think...eleven months! to get this accomplished. Sorry to be so sour, its just that I hate the pressure combined with Christmas crap that still seems to be recycling. Oh, and did I mention, we might have guests? I hope we can move that needle as I do not have the time for them. I am planning on the time R is out of the house to work until midnight to get the work done. The logo (we cannot miss a month, so we need it a month earlier), a new publication, the website "how boutsomething Retro ?" (can anyone out there in the Real World tell me what Retro means...I know what it means to me, which is def. WRONG)?? 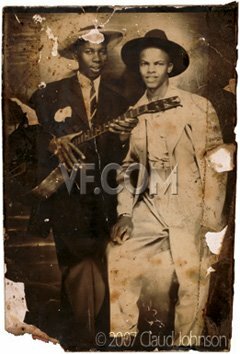 The photograph bought on eBay by Zeke Schein, who believes it depicts Robert Johnson, left, and fellow bluesman Johnny Shines. © 2007 Claud Johnson. ps. Read the new Vanity Fair's article on Robert Johnson, the inspiration of the book by Gary Kelley, Black Cat Bone and book, Me + the Devil by Scott Bakal. It's an interesting tale of the acquisition of an image from ebay that is thought to be the third recognized image of Johnson. There is a lot of history and his story to make Kelley's and Bakal's work resonate with history, music and the grounding that Johnson provided to today's musicians. Take a look.